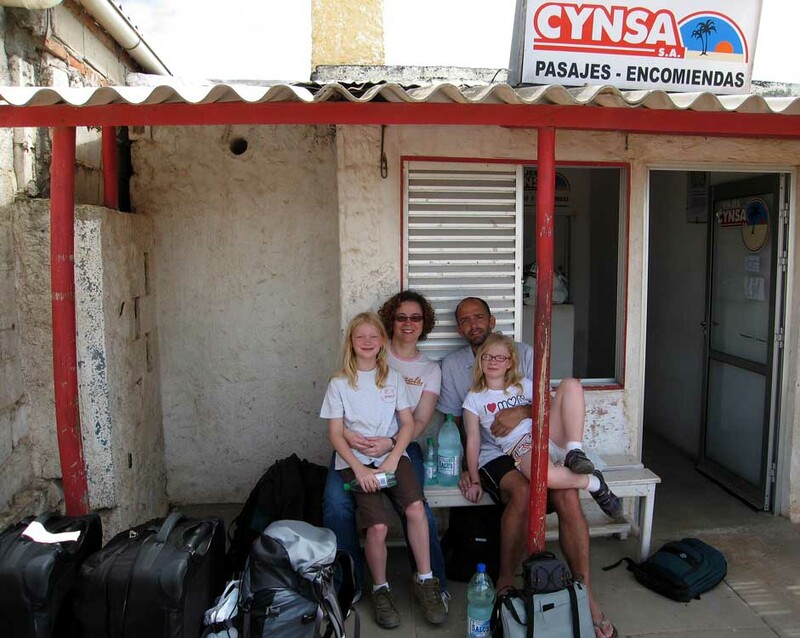 Yes, more family traveling disasters as we ventured from northwestern Uruguay to the Sierra mountains of Argentina (southwest of Cordoba). 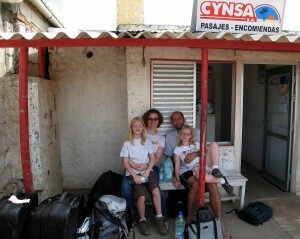 We started for Montevideo on the Saturday before Christmas, leaving Punta del Diablo at 11:15 a.m. (pictured here at the bus stop). The car that we were counting on to help schlep our bags into town wasn’t available, so we had to sprint, in the sun, over dirt/sand roads, with our suitcases to make it to the bus stop on time! The bus trip to Montevideo was long and hot, but generally uneventful, thank God! Sunday, at mid-day, we took a boat from Montevideo to Buenos Aires, Argentina. In BA (which felt like home) we had a 7 hour layover, during which we had to run a zillion frantic Christmas and travel errands. At 10:30 pm on Sunday, our overnight bus left Buenos Aires for Cordoba, where we arrived at about 7:30 a.m. in the morning on Monday. What is the first thing that we did at the estancia? I’m afraid that we accidentally locked Ian in the cabaña. He had to escape out a window with a pretty big drop off. Needless to say, he wasn’t too pleased. This entry was posted on Saturday, December 27th, 2008 at 12:28 pm. You can follow any responses to this entry through the RSS 2.0 feed. You can leave a response, or trackback from your own site.